Dovpo Topside Squonk Mod is the first top fill squonker of the world, no more removing RDA's and using refill bottles or removing bottles with leaking juice. Simply remove the lid and fill up 10ml eliquid, it's really simple. 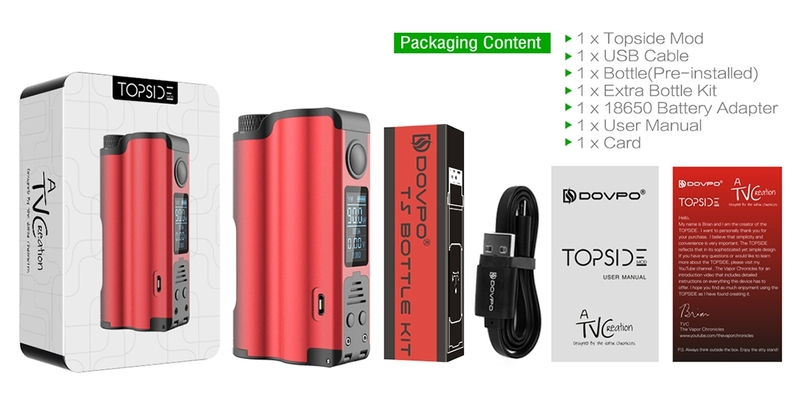 Dovpo Topside Squonker features variable wattage & Bypass and TC (Temperature Control ) Working Modes. It comes with 0.96"OLED Display Screen, and max output power is 90W. All parts that have contact with eliquid are made from food grade stainless steel and silicone. It is a high-quality vape mod. There are six colors ( Silver, Black, Red, Blue, Purple, Gunmetal) for you, and you can have a good vaping experience. ➤ 1. All Parts that have contact with eliquid are made from food grade stainless steel and silicone. ➤ 3. Support Frimware Upgrading, you can have a good vaping experience. ➤ 4. Equiped with 0.96" OLED Display Screen. ➤ 5. Top Filling with 10ml Eliquid, no more removing RDA's and using refill bottles or removing bottles with leaking juice, just simply remove the lid and fill up 10ml. ➤ 6. DOVPO Topside 90W Squonk Mod is the first top fill squonker of world. ➤ 7. Support Battery 21700, 18650. ❤ Please read the user manual carefully before using this DOVPO Topside Squonk 90W Mod, it supports firmare upgrading, and supports TC mod.